The Drentsche Patrijshond, also called the Dutch Partridge Dog or Drent, is a breed that has been imported to North America from it’s home country of the Netherlands. 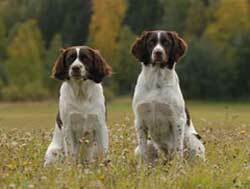 In the 16th century the breed originated from the Spioenen (also called Spanjoelen) which came via France from Spain. In the Netherlands they were called Partridge dogs. In the eastern part of the country, especially in the province Drenthe, these dogs were kept purebred and were not mixed with foreign breeds as done elsewhere. The rural Province of Drenthe was unusual, in that it allowed "even" the common gentry the right to hunt. Thus, the local mayor, the farmer, and the "landed" population in general needed a dog to support their pursuit of various small game. For over 300 years, the Drent was that dog. 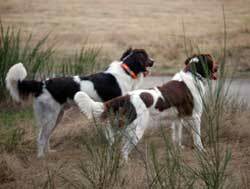 Unlike many other hunting breeds, which were developed by, and for, the "upper crust" only to hunt, the Drent was expected to hunt all game, (and even varmints), and also pull duty as watch dog, child playmate, etc. Some were even used to pull the dog-carts of the day. Recognized by the Raad van Beheer op Kynologisch Gebied on May 15, 1943, the breed has become increasingly popular among foot hunters and families alike. The Drent is known for it’s hunting prowess, as well as it’s sweet nature and love for its family.